Classic King Ranch Chicken Casserole aka Mexican Chicken Casserole or King Ranch Casserole is an easy, make-ahead, delicious entrée loaded with melty cheese, yummy tomatoes, spicy peppers and green chilies and juicy chicken sandwiched between layers of corn tortillas. I’ve been making this King Ranch Casserole for more years than I can count, it’s one of my “go-to” recipes and it’s always been one of my family’s favorites. I’ll bet after one taste it will be one of yours too! 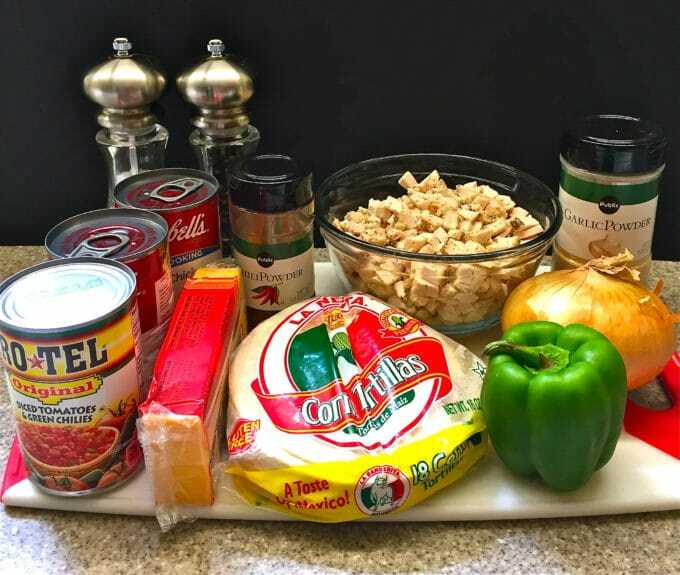 This Classic King Ranch Chicken Casserole is also comfort food at its finest and perfect for your Cinco de Mayo celebrations! There are lots of different versions of King Ranch Casserole with Rotel around, but no matter how you make it, this classic, slightly spicy Tex-Mex chicken casserole is delicious. 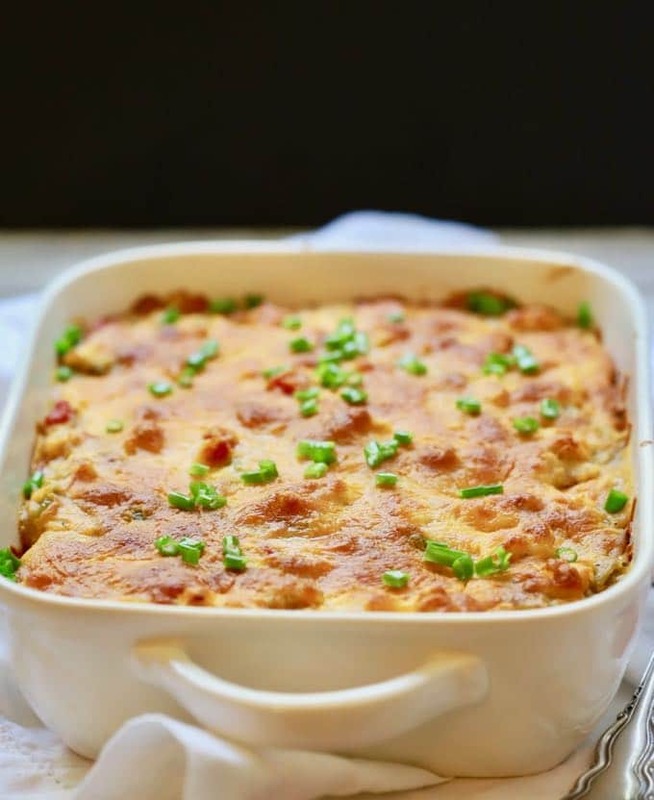 A quick look up on the internet of King Ranch Casserole history says that even though there apparently is no connection to a ranch in Texas by the same name, the name supposedly comes from King Ranch, one of the largest ranches in the United States! 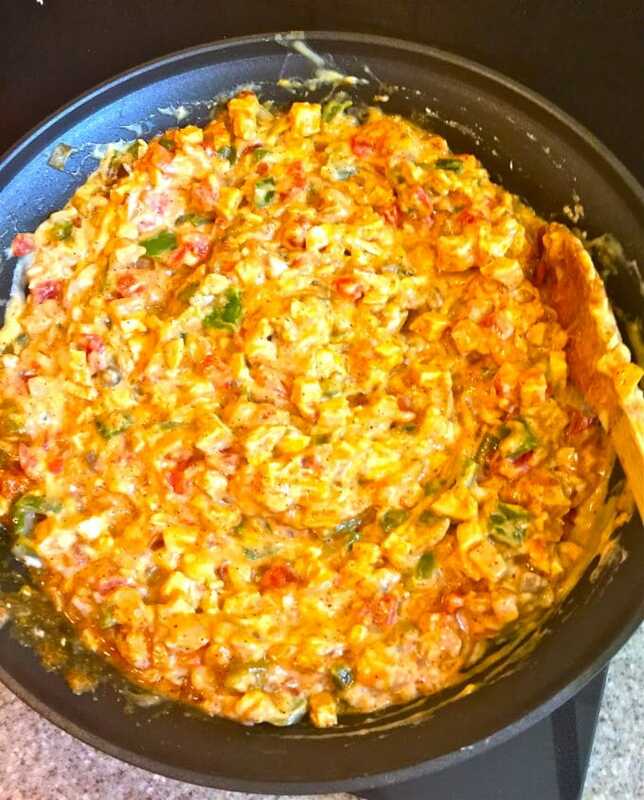 I think this is the best King Ranch Chicken recipe because not only is it delicious, it freezes beautifully and travels well. It’s also perfect for pot-luck dinners, taking to new neighbors, and serving to guests. You can also make this King Ranch Casserole ahead and this recipe serves eight, so I usually split everything up and make 2 or 3 casseroles. Then I bake one and freeze the other one for later on. I love when you can prepare a dish one time and end up with 2-3 entrées. It’s a BOGO of sorts! If you like casseroles like I do, you might also like these easy make-ahead wonders: Chicken, Sausage and Wild Rice Casserole, Easy Baked Spaghetti Pie Casserole, and Easy Make-Ahead Baked Ziti. 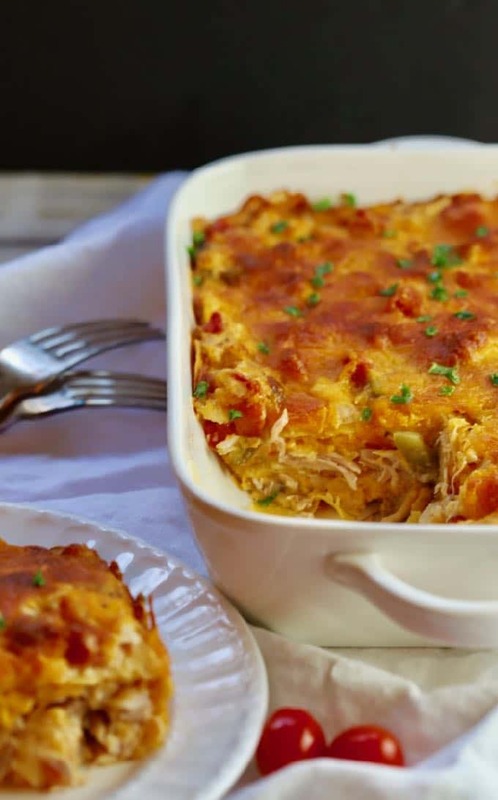 To make this scrumptious King Ranch Chicken Casserole, gather your ingredients which are: onion, bell pepper, olive oil, cooked chicken, cream of chicken and cream of mushroom soups, a can of diced tomato and green chilies (Rotel), chili powder, salt and pepper, garlic powder, corn tortillas and shredded cheddar cheese. Yes, there are a fair number of ingredients, but there are only a few easy steps to assemble everything and it’s ready to pop in the oven. 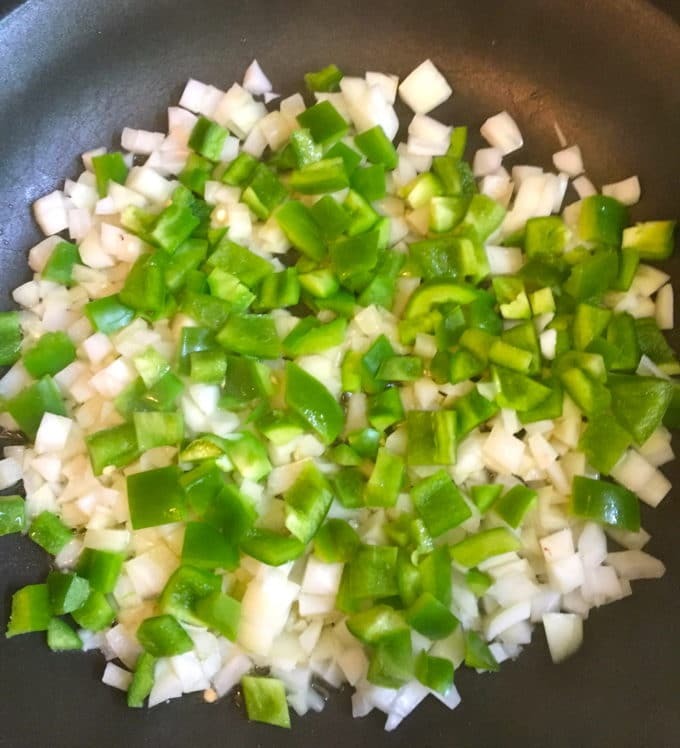 To get started, heat a large skillet over medium-high heat and add the olive oil, onion and bell pepper. Saute, stirring frequently for about 5 minutes or until the vegetables are tender. Add the chicken, cream of mushroom and chicken soups, a can of diced tomato and green chiles, chili powder, salt, and pepper, and garlic powder. Mix well and cook for 2-3 more minutes or until everything is heated. Tear the tortillas into pieces. (You can also substitute tortilla chips.) Put a layer of the tortilla pieces on the bottom of your baking dish which has been sprayed with a non-stick cooking spray for easy clean-up. Top with 1/3 of the chicken mixture and 2/3 cup of cheese. Repeat the layers twice, ending with the cheese. Bake uncovered at 350 degrees for 30-35 minutes. *You can use a rotisserie chicken from your deli. I just drizzled a little olive oil and added salt and pepper to 2 chicken breasts because that’s what I had and roasted them for about 40 minutes at 350 degrees. 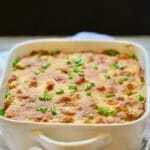 **To make one casserole that serves 8, use a 9×13 baking dish. I wanted two casseroles, so I used 2 8×8 disposable aluminum pans and divided the mixture. If freezing, cover tightly and place in the freezer. When ready to cook, thaw in the refrigerator overnight and bake as directed. If the casserole is still frozen, add about 20 minutes to the baking time. 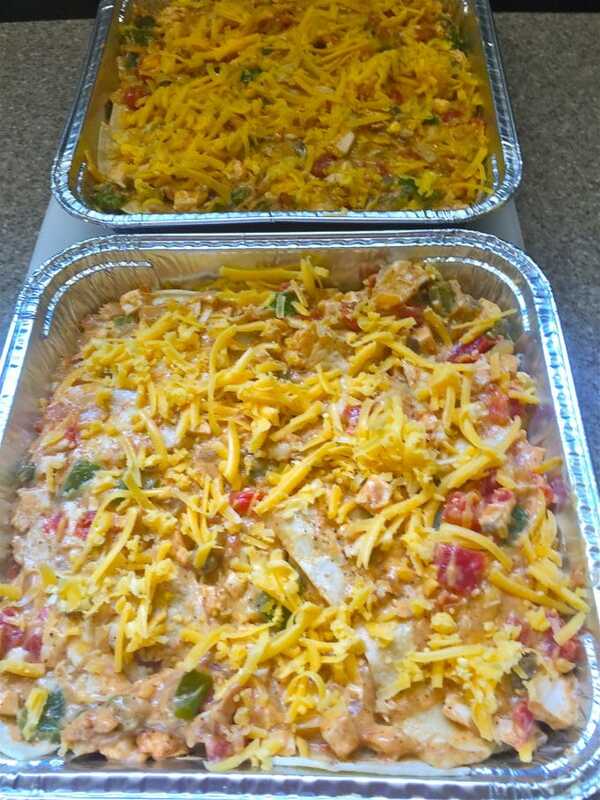 Classic King Ranch Chicken Casserole aka Mexican Chicken Casserole or King Ranch Casserole is an easy, make-ahead, delicious entrée loaded with melty cheese, yummy tomatoes, spicy peppers and green chilies and juicy chicken sandwiched between layers of corn tortillas. It's also perfect for Cinco de Mayo! Heat a large skillet over medium-high heat and add the olive oil, onion and bell pepper. Saute for about 5 minutes, stirring frequently, until the vegetables are tender. Add the chicken, cream of mushroom and chicken soups, a can of diced tomato and green chiles, chili powder, salt and pepper, and garlic powder. Mix well and cook for 2-3 more minutes or until everything is heated. Tear the tortillas into pieces. Put a layer of the tortilla pieces on the bottom of a 9x13 oven proof baking dish** which has been sprayed with a non-stick cooking spray for easy clean-up. Top with 1/3 of the chicken mixture and 2/3 cup of cheese. Repeat the layers twice, ending with the cheese. Optional, to serve, top with sour cream, additional shredded cheese, avocado, and/or salsa. *You can use a rotisserie chicken from your deli. I just drizzled a little olive oil and added salt and pepper to 2 chicken breasts because that's what I had and roasted them for about 40 minutes at 350 degrees. **To make one casserole that serves 8, use a 9x13 baking dish. I wanted two casseroles, so I used 2 8x8 disposable aluminum pans and divided the mixture. If freezing, cover tightly and place in the freezer. When ready to cook, thaw in the refrigerator overnight and bake as directed. If the casserole is still frozen, add about 20 minutes to the baking time. ***You can substitute Tostitos, Doritos or other corn chips for the corn tortillas. Thanks so much for letting me know and your substitutions sound great!